...and then roll to avoid shitting yourself. Now that the Spaniards are out of the way, it's time to move on to the British. There are not as many of them as I'd thought, but there's still enough to be a somewhat daunting task. 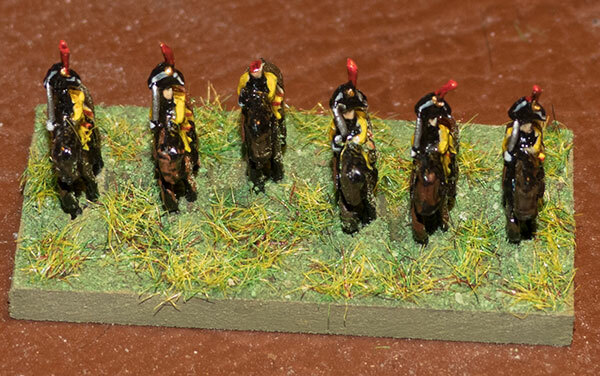 They'll do three battalions of infantry, four of cavalry of various sorts, and four guns (representing four batteries). Plus, there are sets for Wellington (and staff), Hill (or maybe Picton — there's a top-hat present), and the idiot cavalryman whose name I've temporarily forgotten. Uxbridge, that's right. I'll get them all primed black, and then tackle them one battalion at a time. One of my dragoons appears to have lost the top half of his head. It's OK though; I don't think it will have much impact on his military usefulness. And now that I see them close up, I notice that the guy on the left doesn't have a face. 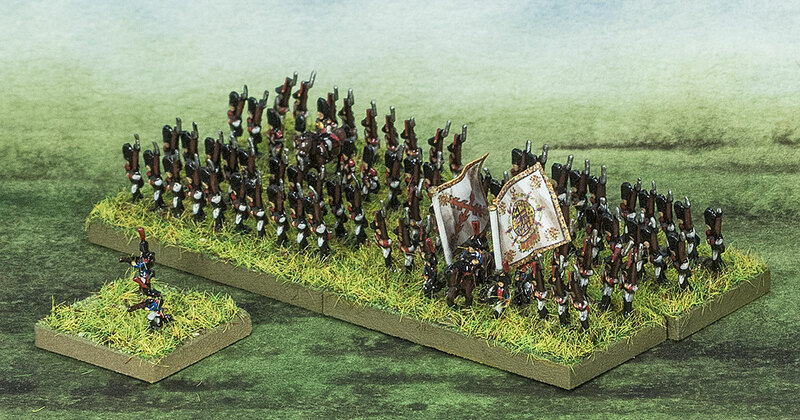 Today I finished off the last of the Heroics & Ros 6mm Napoleonic Spanish that I got from the last Christchurch Wargaming Club bring-&-buy. I've had pretty long breaks between bouts of painting these things, because frankly, I find this production-line stuff pretty boring. Once they're based up — this lot will make four or five bases of line infantry and twenty half-bases of skirmishers, and I have another four-base battalion of infantry and a couple of batteries of artillery already done — I'll get on and make a start on my Napoleonic British. I haven't done an accurate count, but I'd say there's probably about five or six times as many of those as I have Spanish, so it may take a wee while to finish them. And then I suppose I'll have to get some French, since otherwise they'll all just have to fight amongst themselves. 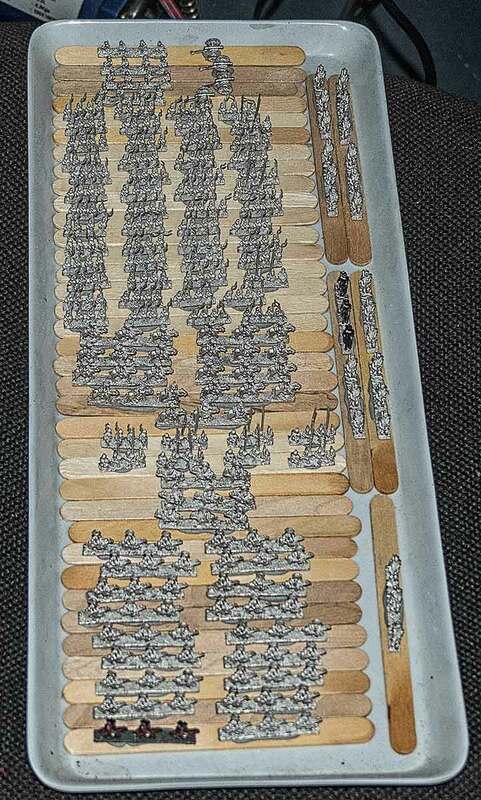 I'm basing them on 40 x 20 mm MDF bases, with the intention of using them with the Black Powder rules. 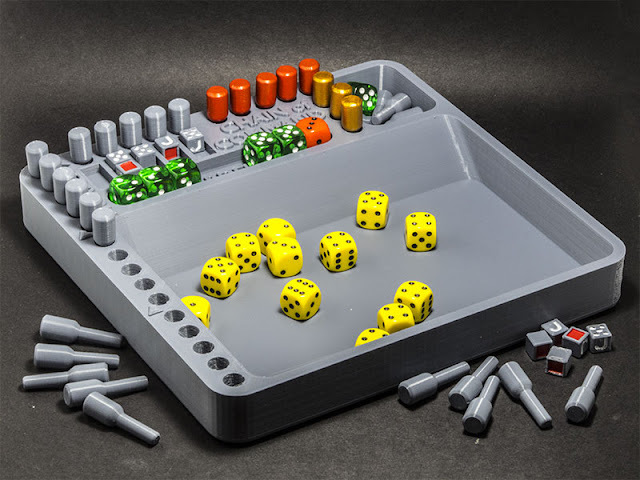 I'm casting my mind back, and I do believe that I've actually never done any Napoleonic gaming at all, so it's probably about time. Turns out they're not the last of the Spanish. I found some cavalry that I'd overlooked; a couple of packs of lancers and dragoons. So, now I have to find out what they looked like so I can paint them. I've based up this lot, and they're shown here with one of the skirmisher stands out in front. The flags are somewhat huge; I've exaggerated the size so that my decrepit eyes can distinguish them on the wargames table. They're images downloaded from the internet, printed on my laser printer, and glued to brass pins stuck into the MDF base. I added a little bit of gold paint and some shading. 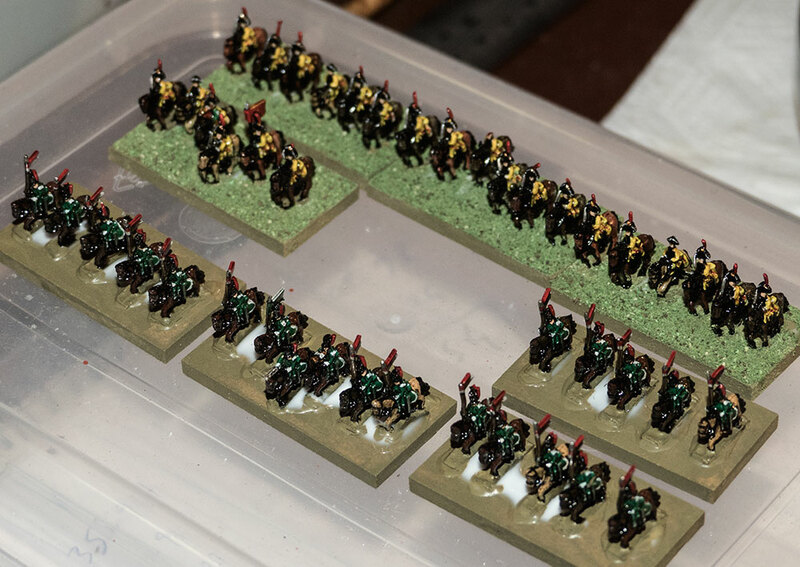 These are the cavalry I found, now painted and almost ready to go. 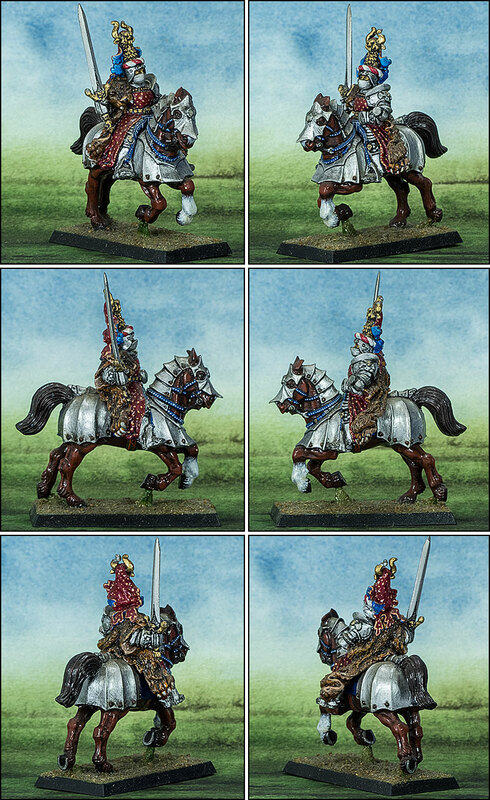 At the back we have dragoons, the Villa Viciosa, and in front lancers, the Voluntarios de España. Though perhaps, considering the level of my knowledge of these things, we should just call them Yellow and Green Horsey-men. Because it's winter here, my workroom is bloody cold. That means that everything takes longer: glue dries more slowly, varnish dries more slowly, and therefore basing these guys properly is going to be spread over a couple of days instead of hours. I had to brush the Villa Viciosa pretty vigorously because the flock was sticking a bit to their varnish, which is not as well cured as I thought it was, so I've delayed flocking the Voluntarios until later — I've brought them all into the warm, hopefully to accelerate the process a bit. I picked up a few Games Workshop 28mm Empire Knights from the bargain bin* quite a few years ago, and then did nothing with them. You will observe that I've left him gloss varnished. That's because it brings out the colours; matte varnish tends to subdue them. * If they hadn't been in the bargain bin I'd never have gone near them. GW's pricing is ludicrously high.